Every month, we look back and highlight the big marketing, design and social media stories of the month. This time we look at an app rebrand, some controversial ads, a new loyalty scheme, brands trolling Trump and each other and how social media influencers are changing the way they promote brands. Keep reading for your January 2019 review. It’s nice enough, but what really caught our eye was the way in which Slack communicated this change. If you haven’t seen it, they wrote this blog explaining the rationale for the change, and the considerations that went into the new design. It’s a refreshingly honest and jargon-free piece, that explains their thinking in clear and simple terms. Too often, brands disappear up their own fundament when justifying this type of change, so huge kudos to Slack for explaining their rebrand in such an unpretentious way. If you’re a celeb with a huge Instagram following, brands are falling over themselves to ask you to promote and endorse their products and services. This has been going on for years, but now some of social media’s biggest stars have agreed to be more transparent in the way they post. The Competition and Markets Authority (CMA) has ordered that stars including Ellie Goulding, Rita Ora and Zoella clearly declare if they have been paid or received free products that they endorse, otherwise they could be in breach of consumer protection laws. Any post containing a promotion must include the hashtag #ad, #sponsored or #freebie in a ‘prominent’ position. If they don’t comply, these influencers could face a fine or even a prison sentence. We work with influencers, and so we welcome this move. Ensuring that it’s clear that individuals are promoting a product for financial gain (even if it’s just some freebies) is a key way of ensuring transparency and will ensure consumers are not misled. Whether it is or it isn’t, it’s a risky move. To the untrained eye it looks as if it’s siding with the Remain movement, meaning it’s potentially alienating 52% of all customers. 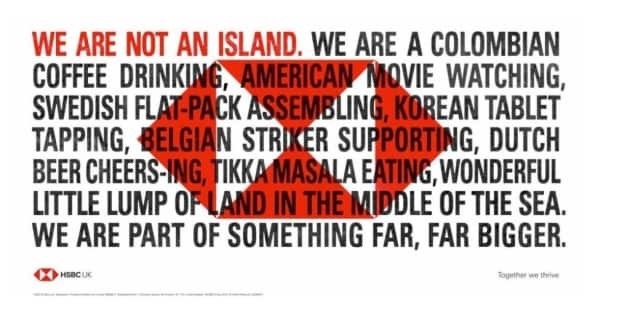 Oh, and actually we are an island. For decades, adverts for toiletries and beauty products have told women that they can be better people, just by using Brand X’s skin cream or Brand Y’s shampoo. The very second men are told that they could be better by an ad, and all hell breaks loose. Gillette have taken a modern approach to masculinity in their new campaign, and we talked about this earlier in the month on our blog. Here’s the ad, if you haven’t seen it. As competition in the TV market heats up, keeping your subscribers will be key to success. Sky are clearly concerned about losing customers to the likes of Netflix, Amazon Prime and forthcoming rivals (Disney) and so have launched a loyalty scheme to encourage their existing customers to remain. Perks such as cinema tickets, prize draws and free Sky Store movies are designed to ensure existing Sky customers don’t head elsewhere for their viewing. As we discussed in our ‘what loyalty means in 2019’ blog, the main problem with the Sky VIP scheme is that they didn’t actually communicate it to customers. I found out about it when I saw it on a billboard opposite the office (and I’m a Sky Diamond tier customer, having been with Sky for more than 15 years). Why wouldn’t you drop your loyal customers an email, or give them a call to let them know? Or, even better, automatically subscribe them to the VIP scheme rather than them having to do it themselves? If you’ll forgive the Premier League pun, it’a all a bit of an own goal. One of the consequences of the US government shutdown is that the White House catering staff are currently not working. So, when the President had to host the Clemson Tigers – the national college football champions – he decided to put on a buffet of fast food. “We have pizzas, we have 300 hamburgers, many, many French fries, all of our favourite foods,” Mr Trump said as he hosted the event in the State Dining Room. As is his wont, the President took to Twitter to talk about his generosity. Trump bragged on Twitter about ordering more than 1,000 “hamberders” – a spelling mistake quickly corrected. That didn’t stop one of the US’ biggest fast food chains trolling him, though. Well played Burger King, well played. A couple of weeks ago, the discovery of a Leeds United employee loitering outside Derby County’s training ground revealed that the Yorkshire club had been ‘spying’ on their rivals for the whole 2018/19 season. So-called ‘Spygate’ made back page news for a couple of days before disappearing off the news agenda. Only then did Pizza Hut UK decide to have a bit of Twitter banter with the club, with this tweet. As you might imagine, Twitter users loved this response.